Earth Sphere Unified Nation Divides into 4 Sovereign States: The Earth Federation, The LaGrange Federation, The Lunar Federation, and the Mars Federation. Mars becomes heavily populated and mined. The Earth Federation Government is couped by The Gaia First Rebels. They kidnap and kill off all of the ESUN leaders, including President Relena Darlian. Mars Federation President Millardo Peacecraft speaks out upon the actions. The Earth First Federation is formed. The Gundam Epyon piloted by Millardo Peace Craft begins to destroy EFF bases and transport Ships. Martial Law is Declared on Earth as all remaining Earth Millitary is sent to destroy the Epyon. Jupiter Energy Fleet is formed, and Jupiter's Moons Begin to be colonized. The underground tunnels of Io become Terraformed. The Colonies launch a counterattack on the EFF Lunar Millatary Base supplying Gundarium Alloy to the EFF. In Response the EFF engage in a full War with the Colonies. Former Gundam pilot Quatre Raberba Winner and his wife Dorothy Winner are assassinated, as well as the 4 other former Gundam Pilots. The colonies are overthrown, and the La Grange Point Council is formed, led by Marimeia Khushrenada. The Epyon and its pilot is killed in the EFF/LGPC War. Both Millataries sign the Earth Sphere Peace Accord. Mars Begins a Massive Armament. The Moon is Split between the EFF and the LGPC. Mars General Lucrezia Noin commands a Large Star fleet and a small army of Mobile Suits to attack The main colonial Cluster, La Grange Point 3. Several Colonies are destroyed, and Marimeia Khushrenada and Lucrezia Noin are killed in the battle. Mars falls into recession, and the Seven Jewels become a hideout for smugglers and criminals. Earth Begins its ginger "purification" by either extrerminating or enslaving the so called psychic "Newtypes". The Remaining Psychic slaves are sent to the Jovian Moons to work as a slave force. The Jupiter Energy Fleet Remains Neutral in the advance. The Gemini Corporation Sends it's twin prodigy's to begin the outer system research setup. The object is a remote colonization of the outer planets for scientific reasearch. however the Gemini Corporation goes bankrupt, and the project is left isolated. Hyper Drive Engine developed. Allows SubLight Speeds. Speeds make it able to reach Mars in 1 day. The Jupiter Moons Slaves Revolt under the lead psychic Trieze Une. The EFF loss all presence in the Jupiter Lunar system, and the freed slaves form the Io Colonial Senate. The Star Revolt Occurs on Earth as Socialist Chineese Seperatists revolt against the EFF. 2 Colonies are dropped on the heart of China, resulting in a mass extermination and a major envirmomental catastrophe. Earth becomes completely habitable after Advanced Terranforming returns the planet to its prime. Lunar Gundarium becomes heavily mined, and the quality of the metal drops. The LGPC begin a massive attack attack on the ICS, however, the fleet gets caught in Jupiters Massive Gravity well, and becomes lost. The colonies overthrow the martial system and become neutral. Mars Begins to develop its own psychics and discover trace amounts of Gundarium in the martian soil. Mars Begins to supply the ICS with food and technology as the Veridian Treaty is signed. The Treaty ally's Mars and Io and calls for mass Terra Forming. The last soldier of the Eve War dies. A massive Virus epidemic breaks out in the colonies of the newly formed La Grange Point 6. All of the colonies are quarentined and isolated. In fear of the epidemic spreading, the EFF destroys all the colonies. 2 weeks later a cure is found. The Jupiter Energy Fleet has become a prey of 2 mysterious blue suits. After one month, the second suit disapears. A popular Gladiator Sport is founded on Mars, attracting people from all over the Olympian System. As National Competitors aresingled out, intense political and national rivialry occurs from the Games. The EEF Constructs a new Mobile Suit Under the Leader Heindrich Jackson. The Mobile Suit is a prototype constructed out of Refined Gundarium. The LGPC, MC, and ICS begin scrambling to construct thier own Gundams. Heindrich Jackson is assassinated by Earth Pacifists. The EFFs Gundam is destroyed in by the pacifists. The EFF Millatary retaliates and kills off the pacifists, and installs Martial Law. Mars' Psychic children program leads to cloning and production of nanites. The result are horrible genetic freaks with incredible psionic power. A Strang blue mobile suit assualts the labs and holding pens, raising it to the ground. Last recorded encounter with the Blue Mobile Suit. Project moves under codename Akuma. All independent governments begin development of advanced Mobile Suit systems. The Equal Wars whittle down all goverment Mobile Suit forces. 93% of all Government millatary forces destroyed. Terrorists kill the current LGPC Leader. General Keoi Phillips takes control. The Earth Becomes Led by General Paul Greego. The Jovian Lunar System becomes populated by pure "Newtype" psychics. The Psionic Amplifier is developed by the Earth Sphere to amplifly the powers of normal pilots. Mars Steals the Technology. Project Akuma Destroyed by a wave of Lightening Mobile Dolls. Devolpment and Genetic manupulation of children all along the Olympian system begins modeled after the dead projects results. The Martian Leader Ylas Marquise dies of cancer. Governor-General Alexander Whitewolf Assumes control. July 4, A celebration on Earth in the American Sector of the EFF Reveals the first modern Gundam. The LGPC Begins development based on the design. Mars spies steal the Gundam's basic data from the main LGPC mainframe. The Knwoledge is Shared with Newly appointed Lead Ioian Senator Odeon Satoki. Lightnening Mobile Dolls Begin to attack trade ships and Jupiter Energy Fleet Carriers. Beam Technolgy is stunted. NanoSoft develops the Ion Cannon. The Cannon can safely disable Mobile Suits. Mars begins development of Ceramic Compsite to combat the effects of the Ion Cannon, as well as soften Beam weapon blows. Ddosk Ballistics begin mass production of ballistic weaponry. The LGPC begins development of Mobile Doll systems base on old White Fang Designs. Mass production of single Mobile Suits stop all along the Olympian System. All 4 Governments begin Training advanced humans to pilot Gundams. Gundams First begin to be created. February 2nd, Lightening Mobile Dolls assault and destroy the Plutoian Colony. Mars assumes control of the colony, as well as forming another underground Colonies on Venus. The Neptune and Asteroid Belt Colonies are evacuated and abandoned. A peace accord is signed between the 4 Governments to destroy the renegade Moble dolls. The EFF and MC begin massive development of Mobile doll forces. Several Gundams Appear. Failed Saturn colonies are abandoned. Drug Syndicates begin forming from the ashes of old Mafia and drug cartels. The Largest is the Gen'yaku Syndaicate. August 1st, Lightening Mobile Dolls First attacked by the 4 governments. September 4th, Gamma Gundarium with Ceramic Composite Developed by Martian Labs. Metal Composition is stole by spies. March 18th, The Lightening Battleship Bolt discovered. Allied Governments prepare an attack. July 15th, Martian Rebels succede from Mars and Assume control of the Venusian Colonies. The Venus Council is formed. September 30th, Operation Bolt commenses as the battleship Bolt is destroyed. As soon as the destruction is confirmed, the 5 Governments begin attacking Each other. December 21st, Remnents of the Lightening Mobile Dolls Begin attacking remote settlements and beging stealing minerals. December 29th, United Pluto Directorate formed by Mars Confederacy ellite Wraith Mobile Suit Division. The Colony Changes hands from Tsum Katago, Tom Epsilon, and finally to Ashe Marquise. January 17th, 2 seperate allied attacks occur on the remnents of the Lightening Mobile Dolls. Two nearly identical blue Suits appear. The suits are made of a super strong Gundarium Alloy called G-Metal. Mars and Pluto Suits begin to be retrofitted with the Gamma Gundarium Composite. The EFF redevelops Neo Titanium to match the Gamma Gundarium. March 15th, Kari Shiro Assumes Control of the ICS following the disappearence of Odeon Satoki. June 22nd, Unexplained Martian kidnappings result in Mars blaming Earth. Mars mounts a heavy assault on the EFF. However the Blue suits reappear with Lightening Mobile dolls and declare themselves alligned with the EFF. They are now called the Gemini forces. Gemini is led by Hyas Polyduces, and strongarmed by the Gundam pilots of the blue suits, Regal and Imperious. The Martian Forces are defeated. Gemini Assumes control of the Moon. October 1st, The LGPC speaks out on the Gemini occupation on the Moon. 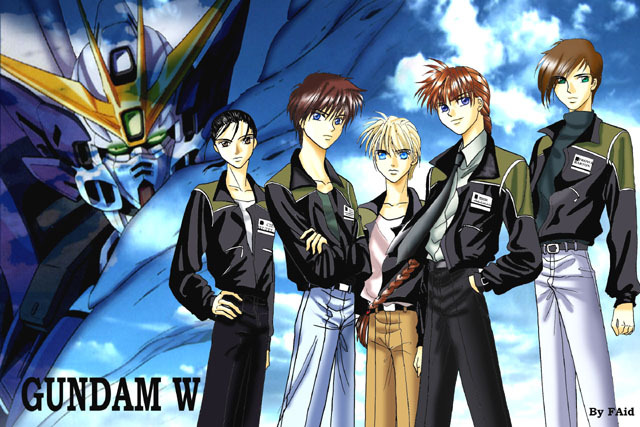 October 2nd, The LGPC colonies are attacked by Gemini, unleashing a new army of Zodiac Newtype Super soldiers. 16 colonies are destroyed, and the LGPC is forced to retreat iots millatary forces. LGPC leader Keoi Phillips is killed in the battle. The colonies never recover. November 11th, Gemini mounts a failed assault on Mars. This is gemini's first defeat. Howeve it showcases the arrival of a massive Newtype fortress the Neo Genesis. November 13th, the Venus CCouncil is assumed by Plutoian Soldier Shiro Kusinagi. The Venus Alliance is formed. January 1st, the ICS is attacked by Gemini forces. Soldier Leo orders all of the moons to be bombarded by Nuclear Missiles. The refugees of the Moons retreat to the 7 Jewels of Mars. January 2nd, the Pheonix Vanguard, led by Phrixus Khushrenada, breaks away from Gemini. March 6th, General Paul Greego is stricken with a virus shortly after complete alliance with the EFF and Gemini is formed. Vice Colonel Xavier Fenix assumes control. April 27th, Venus leads a massive attack on Earth. The assault fails, and the Pluto and Venusian colonies are attacked with a Nuclear strike as well. May 8th, Xavier Fenix is captured by Venusian forces. May 10th, Gemini attacks the reamining Venus fleet. A new Gemini Mobile Armor captures Xavier and imprisons him for betrayal. Colonel Odin is put in lead of the EFF. October 5th, Gemini forces are attacked by the 6 governments. 50% of Gemini forces are lost. The Moon base is assualted and destroyed. October 31st, Marcus Jackson reveals the Freedom Coalition, a collection of civilians yearning for peace. November 11th, Twilight of the Gods. The 6 Governmnets ally with the Pheonix Vanguard. The Zodiacs are freed and the Gemini Gundam pilots Imperious and Regal, as well as the Gemini Leader Hyas Polyduces are killed. Mars General sacrifices himself to kill Regal and Imperious. January 1st, The United Solar Fleet is formed out of the ashes. The new government is led by Marcus Jackson and centered in Berlin. February 26th, Marcus Jackson calls the world to total Peace. The USF Millatary is set up to protect the civilians. March 3rd, The Gen' yaku Syndicate becomes a Mobile Suit power. April 13th, An unknown Group begins raiding USF bases. August 6th, Jupiter begins to openly oppose the USF and PV. August 28th, The war escalates. Millatary analists predict with the massive arming and intesity of fighting, the end of the war is near. The USF poses sanctions on Lunar trade. August 30th, The massive battle occurs in Chicago. The result is Chicago being struck by a nuclear weapon by USF leader Marcus Jackson. The Colonies, Earth, Mars, and the Jupiter moons seek to rebuild. Neo Earth Federation, led by Joshua Noventa United Colonial Council, led by Varlon Dezun Sovereignty of Mars, led by Dominique Marquise and the Council of Jovian Moons, led by Kageda Mariami. Begin Mobile suit construction and Millatary Arming. A CJM Resource Satellite crashes into a havily populated area of Mars. NEF Allies with the CJM. UCC Minority Leader Gabe Capistan speaks out against the SOM alliance. NEF Columbia Base Destroyed, UCC suspect. Failed SOM attempt on Ganymede places doubt in the SOM/UCC alliance. Note that this timeline was not created by me. I most definatly do NOT have the time to make something so... so large as this. The site I took this from is located here at the bottom of this note. Should the site go down and the link stops working, it is not my faught but atleast I saved his, TomDuo, work. Copyright © 2004 Mira Watanabe. All Rights Reserved.